About me Prior military intelligence analyst converted skills to financial and market analysis. Did You Really Think VIX Will Remain Under 20 For Long? The drop today was expected. We have just started minute wave 3. We will take out the recent top and most likely see our next reversal between 2830-2870 over the next 2-4 trading days. Check out all in-depth analysis on my site. Still looking for market top by mid-November above 2950-3000. The wild ride is not over yet. Can we watch the S&P 500 Index finally move up in September? Based on today's movement, the diversion in the moving average I track confirm the index still has room to drop. Good news has the bottom tomorrow. Bad news, the bottom is still one day away. I will update my article on the top of minute wave 5 once 4 ends. Bottom appears to be between 2868 and 2876. Not far, but will be quick. Stay tuned for more! Could Near-Term S&P 500 Bottom Be In? We have been following Micron closely and waiting for wave C to complete. It has and we are positioned for big gains over the next 5-12 months. This movement will outlast our projections for the major markets. What are the reasons for the rise, tops and drops? Our guesses align with trade, and politics. 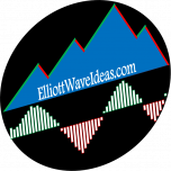 Our full analysis is at Elliott Wave Ideas dot com.